For most of the last few years, I have posted this prayer that my grandfather wrote in the 1950s. It has and continued to move me. So many small things that we often take for granted are to be remembered and celebrated. In light of the world today, I thought it was especially special to those of us with children. Honestly, this prayer gets me every time I read it. So many things that I am thankful for this Thanksgiving — my family, my friends, my home, our community, our church, Ian’s school, and so much more. I am so blessed. May you and yours be blessed this Thanksgiving Day! Hope you have a great day! Happy Thanksgiving to you! May you have a wonderful day with family and friends and celebrate what you are thankful for. I am thankful for many things and many people. I am blessed beyond measure and so very grateful. We recently found out that we had ancestors come over on the Mayflower and helped settle Plymouth. The knowledge that someone from our family was there at the first Thanksgiving is so very special. It has made the story much more real for Ian and for all of us. These people were Ian’s 15 great grandparents, if I counted it correctly. Mom discovered this amazing news during the update of our family history. I have been helping her with it and am having a blast. My favorite Thanksgiving prayer is one that my grandfather wrote back in 1951. This photo is of me sitting on his lap many years ago. As my regular readers know, he was and remains my favorite storyteller. He taught me so much and for that I am thankful. In light of the world today, his prayer is still quite poignant and special. After all, family and friends are still what is most important. Thank you Grandpa for your amazing and touching prayer. You had a way of capturing events in life that are easy to take for granted. Many people who have lost loved ones may never know these joys and thrills. May we be a comfort to others in their times of loss. I have found as I get older that it is the little things and normal things of daily life that I cherish the most. The daily routine and things that I can count on are so very special. I hope and pray that I never take them for granted. This year I also pray for peace. Sometimes I wonder if we will ever have it again. May we truly have peace on earth and goodwill towards men. And I pray for good health and safety. May those who are in pain or sickness be healed and become stronger. And may we take care of one another. Happy Thanksgiving to my friends and family. For all of you, I am really and truly thankful. And I am looking forward to time together to eat, laugh, chat, and make new and wonderful memories. Happy Thanksgiving. Here is a prayer that my grandfather wrote and was published in November 1951. Here I am pictured with him in 1990. He was and still is my favorite storyteller and an amazing writer, educator, father, and grandfather. He wrote a newspaper column for many years called “Parent’s Corner.” It sums up the perfect Parent’s Thanksgiving Prayer to me. Each time I read it I am in awe of the pictures that his words so vividly describe and I tear up over them. For parenthood we thank thee. And, our Father-God, to thee we pray for peace. If it be thy will, grant that we may continue our lives together in the precious years to come. May you have a blessed and wonderful Thanksgiving! And, may you be thankful for those special to you. Hi and happy the day before Thanksgiving! I don’t know about you but Thanksgiving is my favorite holiday. Good food, great family time, catching up with friends, and being thankful. What can be better? This year is even more special since we found out a few months ago that we are descendants of people who arrived in the United States via the Mayflower. To think that my relative was one of the first to arrive is truly amazing. And that this woman who is 10 generations before me was one of the pilgrims that I have learned about in school. WOW! 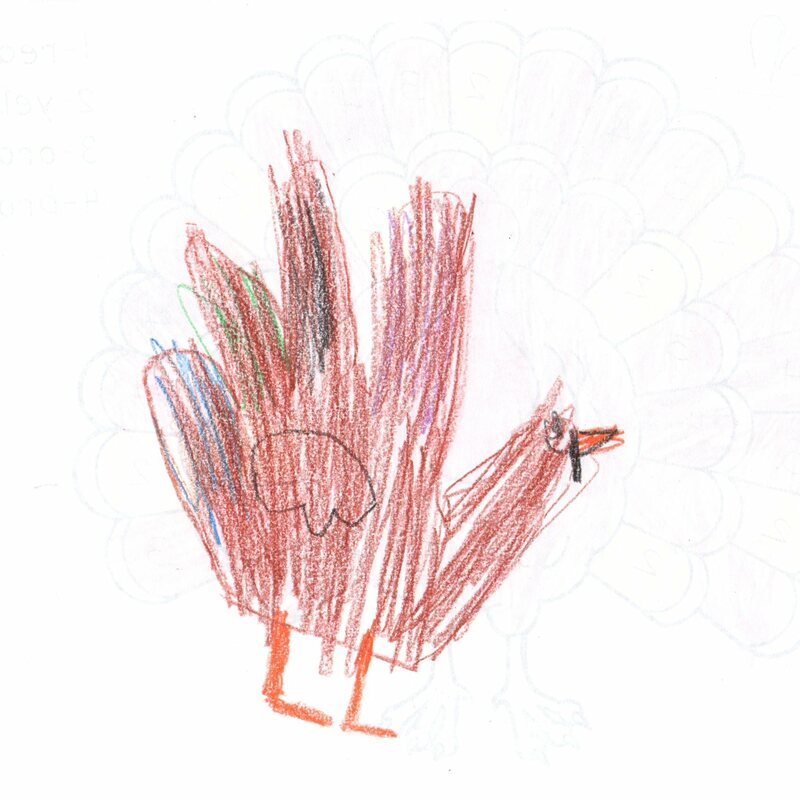 Ian recently asked me, “Do you think there was turkey at the first Thanksgiving?” I told him, “That is a very good question Ian. We should look that up and figure out the answer. If there was, it more than likely was wild since they couldn’t go to the store.” He stopped to think about that, grinned at my answer, and then went back to playing. 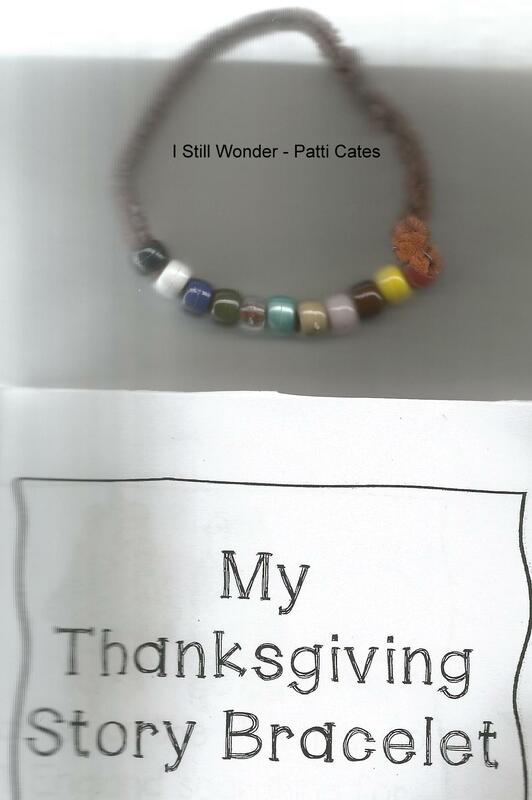 Yesterday, Ian brought home a booklet and bracelet that they’d worked on at school — My Thanksgiving Story Bracelet. In the booklet, they colored the picture with each explanation of bead color, and read the story. My scan of it didn’t turn out very well but you get the general idea. Hope you enjoy it! What a wonderful treasure for his first grade class. This is such a great way to learn history because it’s fun and interactive. Thanks to his teacher who worked on this with the class! The pilgrims were a hearty and brave group of people. Knowing that the pilgrims grew all that they had or shared with the Indians is incredible to me. I will think of them and their struggles as I am shopping this afternoon. The fact I can shop for what I need at the grocery store or farmer’s market is one that I feel blessed to have. Then I can come home, store the food in the refrigerator, use our running water to prepare the food and then clean up, and use the stove and oven to prepare it. What an amazing blessing! I am honestly and truly thankful for all of those amazing luxuries. I do my best each day not to take them for granted. Blessings and being thankful, that is what is about. That and the breaking bread with loved ones. One of my favorite magazines has a quiz about Thanksgiving. Here are my answers. What are yours? May you have a blessed and wonderful Thanksgiving! Today is the day of Thanksgiving! I hope that you have someone to share it with and can truly enjoy it! This afternoon we will be praying, giving thanks, and eating with our family and friends. Everyone brings a dish to share. My contribution is green bean casserole and perhaps a dessert. It is a great meal, often with a game on the television, chess will be played, and perhaps a card game or two. And, the kids will play. The house will be very noisy but we will have lots of fun. We are so thankful to have this fun, wild and crazy bunch to celebrate with. Several generations of family and friends will gather together. This year my mother discovered we are descendants of a family who arrived in America on the Mayflower. Knowing there is a tie to early Thanksgiving celebrations makes this one even more special to me. I wonder if on this Thanksgiving, we can truly be thankful for the people in our lives who mean so much, what we have and do, and enjoy and appreciate those who we are with. I am planning to do just that. Hello and Happy Thanksgiving to you and your family! Hope you have a great day today!! I wanted to post A Thanksgiving Prayer that my grandfather, Dr. James Richmond Barbour, wrote in November 1951. 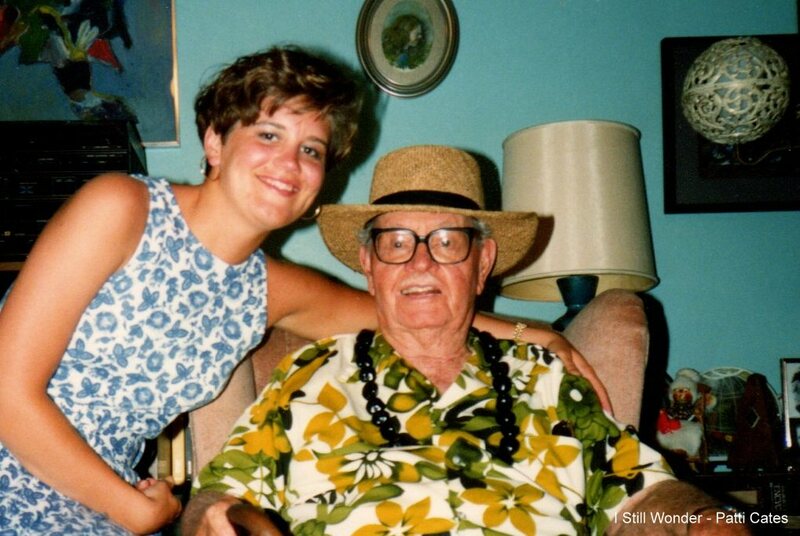 He was an educator, writer, psychologist, and fantastic grandpa. 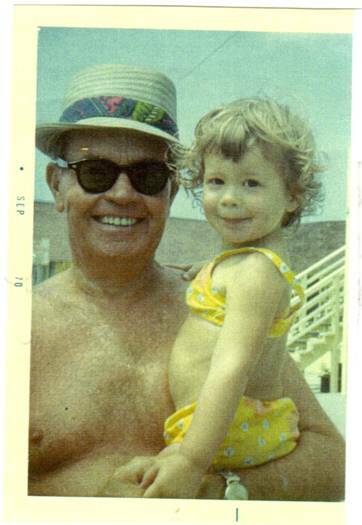 Here is a photo of me with him when I was a toddler. A Thanksgiving Prayer was published in Grandpa’s “A Parent’s Corner” column in the San Diego Evening Tribune newspaper. I hope that it will bless you as much as it does me! For the ringing laughter of our children playing, for their giggles, and the moist throaty chuckles of our babies. 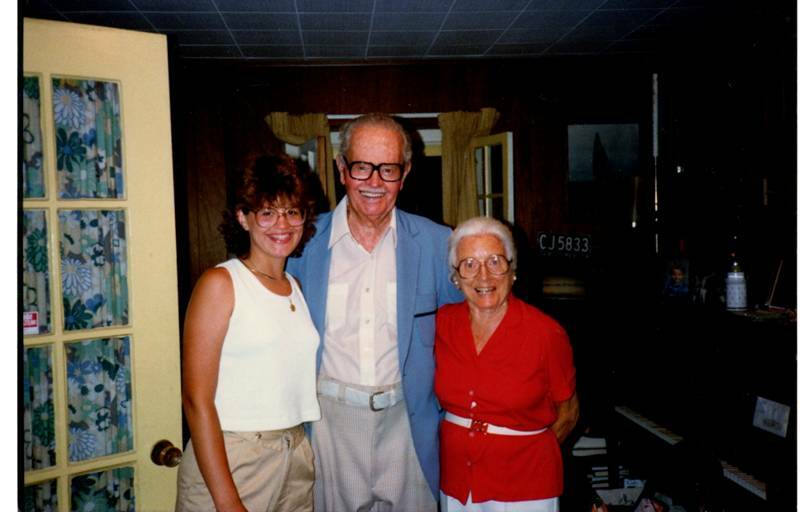 Here is a photo of me with my Grandpa and Grandma in 1986. This is how I remember them. They had an amazing love for one another and for their family. You can hear this love in this prayer about his children and their growing up years. They had three girls and one boy. My mother was the third daughter. I am blessed and honored to be a part of this amazing family. As I was typing it, I was tearing up thinking about both Grandpa and Grandma and this beautiful prayer that he wrote more than 50 years ago. May you have a wonderful Thanksgiving!! I hope that you have many blessings to be thankful for and special people to share them with!! God Bless!